Readers of this site will probably recognize the name of Tim Challies, who I link to from time to time. He is one of the best-known figures in the Christian blogosphere, both for his blog Challies.com and Discerning Reader, a book review site. He’s also been known to live-blog a conference or two. He is, in other words, one of a new breed: a somewhat famous blogger. Challies defines discernment as “the skill of understanding and applying God’s Word with the purpose of separating truth from error and right from wrong.” His book unpacks both the need for Christians to hone and practice this skill and some ways to do so. Discernment seeks to obey Paul’s charge to “Test everything, hold fast to what is good. Abstain from every form of evil.” This involves the dreaded act of “judging,” but Challies explains in what sense Christians are to judge and in what sense we may not judge. Discernment is not just feeling out our own emotions or searching for some secret truth God has not revealed elsewhere; it is learning to apply the objective truth of God’s Word to any and every situation, sifting out the good from the bad. It is both a gift, something God imparts in a particular way to some believers, and a skill or discipline, something all believers should pursue and practice. And it is a skill that is critically needed in the church today. There were only a couple of issues I had with this book. First, I think Challies goes too far in emphasizing the objective aspects of discernment over against the subjective. He rightly emphasizes discernment as being based on the standard of Scripture, but doesn’t seem to acknowledge any subjective element, as though every question we might face could be solved by solid biblical exegesis. Second, in his chapter “The Gift of Discernment,” he says: “What the church needs today is a class of believers who are identified as the experts in discernment and as those who have special ability in this area.” This and other comments in that chapter made me nervous—it almost seems like Challies is creating a new church office, that of “discerner,” which I thought detracted from his main idea, that discernment is the task of every Christian. But again, these were isolated incidents in the middle of a great book. 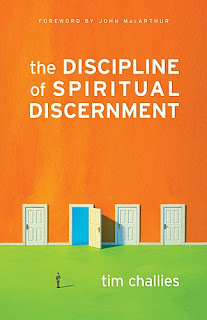 The Discipline of Spiritual Discernment is a timely book. The church today is frighteningly emotion- and experience-based, and we need to learn to test everything by the Word of God. Challies doesn’t just sound the alarm, he offers help toward a solution. He does this with a high view of the Scriptures and the local church, so that the fruit of his encouragement is likely to be thoughtful believers who serve God and his Kingdom well. Thanks for the comment. I probably should have said, “as though every question we might face could be solved by solid biblical exegesis alone.” Obviously the first step to any question is “What does the Bible say?” But my point was that there is a subjective element to many questions too. For example, if I’m examining whether I’m called to be a pastor, the first thing I and others should ask is whether I’m biblically qualified. But even if I meet the Scriptural qualifications (husband of one wife, able to teach, manage household well, good reputation with outsiders, etc. ), that doesn’t necessarily mean I’m called. The Bible doesn’t tell me (or the people examining me) whether I individually am called, where I should go, etc. That’s where the subjective element comes in– always informed by Scripture, of course, but seeking to know the Lord’s will on a specific question that’s not answered in Scripture.